Last month, Apple began to roll out a public beta of its upcoming iWork for iCloud online office suite by sending email invites to select users for testing the new apps. But now, 9to5Mac has noted that due to an ‘overwhelming response’, Apple is apparently limiting access to the beta service. 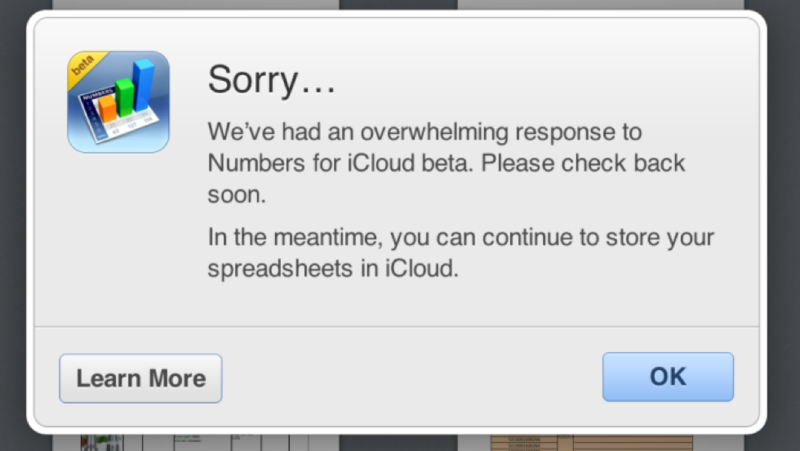 Users trying to access the iWork for iCloud are being denied access with a message (shown above) telling them to ‘check back soon’. With Apple releases iWork for iCloud to general public this fall, users will be able to create and edit documents, sync between apps, and access their files from anywhere. Apple announced during its WWDC keynote that iWork for iCloud will be fully compatible with both Windows and OS X, and across three different browsers i.e Internet Explorer, Chrome, and Safari.